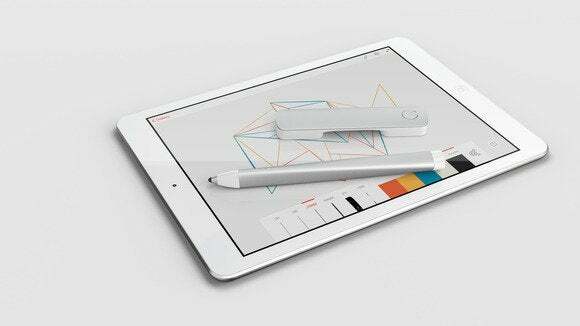 For a few years now, Adobe’s been teasing its followers about Project Mighty, its iPad stylus and ruler prototypes. The day has finally come: Those prototypes have graduated to full-fledged products in the form of Adobe Ink and Slide, available in the United States for $200. The accessories are also paired with two new iPad apps from the company: Adobe Line and Sketch. It’s hard to talk about Adobe’s latest accessory offering without first acknowledging its price: At over $100, The Ink and Slide has the highest price tag we’ve seen in the iOS stylus market. To be fair, that’s partly a result of Adobe packaging the Ink stylus and Slide ruler together—you can’t buy them separately. Which is a shame, because while Ink stylus is a pretty good iOS pen, it’s not the best in its class; the Slide ruler, however, is the kind of unique accessory I suspect many people will want. That’s not to say the Ink and Slide package isn’t worth picking up. Adobe partnered with longtime stylus-maker Adonit to create the hardware, so the Ink sports the same panache and Pixelpoint technology you’ll find in the Jot line of iOS pens. The Ink is a tri-corner aluminum stylus, its edges curving from top to bottom much like ribbons on a May pole. The look is as functional as it is fabulous, as the changing edges prevent the pen from rolling away on an angled desk. The curves also make for a surprisingly comfortable stylus to hold. The Ink stylus's 3mm nib borrows from Adonit's Pixelpoint technology. Like Adonit’s Jot Script, the Ink’s 3mm nib is made of plastic and glides easily across an iPad screen, yet it provides excellent resistance and feedback when drawing, outlining, or writing. It’s a tad lighter in the hand than I like my styluses to be, but that’s largely a matter of personal preference. The Ink has two distinguishing features on its body: a customizable color tip at the end, and a single button along the side. The button triggers the quick tools screen in either of Adobe’s new sketching apps, giving you access to color tools, the clipboard, a palm-rejection switch, and more. Customize your Ink stylus with a custom LED color on the end of the pen. As with the Jot Script, you can use the Ink stylus in any app, but to really dig into its features, you have to use it inside proprietary apps. In this case, those apps are Adobe’s new Sketch and Line programs. When working in Sketch (which is a very nice app, though it oftentimes feels like an upscale Paper clone), you can change the stylus’s colored tip, enable or disable palm rejection, access those aforementioned quick tools, and draw just about anything you like. You tap to pair the stylus, much like you would in Paper, and palm rejection is actually quite good: I had the Ink malfunction only once or twice in several afternoons’ worth of drawing, which is a near record for me for those sorts of things. Tap the Ink's button to get a radial menu of important features. Ink’s one letdown is in its precision: Despite the 3mm Pixelpoint nib, I couldn’t get the Ink to consistently trace the same line after drawing my initial volley. Sometimes it would do just fine, but other times, it wiggled and wobbled and drew a full line’s width away. This is the one black mark on an otherwise solid stylus. I’m not sure if the fault lies in the hardware or in software calibration—because of how few tools are available to developers for screen pressure and sizing, stylus precision is incredibly difficult, especially when drawing outside of a zoom—but if it is due to software calibration, an update could very well fix the problem. And for those invested in Adobe’s Creative Cloud, the Ink stylus offers one other tantalizing feature: integration. When you tap-connect your Ink stylus within an Adobe app, your Creative Cloud assets automatically download into that app, letting you access your favorite drawings, use your favorite color themes, and copy and paste assets between devices. It’s a lovely perk for those who want to work inside the Adobe ecosystem, and it saves you the trouble of hardwire syncing palettes, projects, and more. If the Ink made me hesitate despite all its promise, the Slide did the opposite: I was initially skeptical of the need for a Bluetooth “ruler” on my iPad, but I came around very quickly. The metal-and-plastic tool is two-thirds the length of the Ink stylus, with two large pads that come down to rest on the screen. When you use it inside a compatible Adobe app, like Line or Sketch, it becomes an instant straight-edge ruler for your finger or stylus: No matter how wobbly your pen may be, the Slide forces the line to be straight. Even without the physical Slide ruler, you can still use the Touch Slide feature in the Line and Sketch apps. Pretty cool, for sure, but I was still skeptical. You see, both the Sketch and Line apps offer a virtual version called Touch Slide for those lacking the physical tool, and it’s quite a good on-screen representation of the ruler at that, offering two touch targets to move it around the canvas. But the actual Slide ruler—which feels almost weightless in your hands—offers a delightfully tactile drawing experience in the way that virtual sketching can’t quite replicate. When I use a stylus, it’s difficult for me to forget that I’m drawing with a piece of plastic or rubber on a glass screen. The tactile sensation just isn’t there: The pen is too sticky or slippery against the glass, handwriting recognition isn’t good enough yet, and so on. But the Slide ruler is different. On a glass screen, the Slide glides across the “canvas,” and when you draw against it, it feels much like the act of tracing against construction paper. The effect is especially pleasing when used with Adobe Line: The company’s new drafting app is one of the neatest drawing programs I’ve seen in some time, and it feels like it was made to show off the Slide’s true capability. I imagine shape gurus and architects will have a field day with Slide and Line; the app is clean-cut and simple, but offers a variety of line types, widths, and colors—not to mention the app’s wide variety of stamps. Adobe's Line app was clearly tailor-made to show off the power of the Slide ruler. Do you need Slide to accomplish amazing things in Adobe Line? Not really. But it feels so good to work with tangible tools that you may not care. The message I took away from Adobe’s latest hardware offerings is this: We may work in a digital landscape, but you can still delight in hardware tools. Depending on your relationship with your iPad and drawing, the first iteration of Ink and Slide may not be must-buy items, but they’re impressive entries in an accessory field crowded with rubber-nib boredom. And moreover, they have potential to grow into something truly great. You may not truly need Ink and Slide to make art, but it feels so good to work with tangible tools that you won't care.